I recently met a young man outside the hall of a conference venue who asked why I had not yet written anything about the economic hardships befalling Ethiopia as a result of the decision to land lock itself following the independence of Eritrea—its former province. This article is, therefore, a brief description of what is meant by ‘landlocked’; a listing of some of the countries that are ‘landlocked’; and a short survey of the economic consequences of being ‘landlocked’ as confirmed by the available empirical evidence on the subject. A landlocked state is a sovereign state entirely enclosed by land, or whose only coastline lie on closed areas. A detailed study of landlocked countries’ human geography by Caitlin Dempsey (see map), lists a total of 48 countries currently landlocked, including partially recognized states. 42 of these are landlocked; two are doubly landlocked; and four are partially recognized states. Only two, Bolivia and Paraguay are from South America, the rest are all in the Afro-Eurasia world. As might be expected, some are affluent states (Switzerland, Luxemburg, and Liechtenstein); but the majority of these countries are, what economists call, landlocked developing countries (LLDC’s). Unsurprisingly, Nine out of twelve or 75% are currently listed as having the lowest HDI (Human Development Index). Of the 48 countries, none are a major power, and 15 are in the continent of Africa. Ethiopia is the most populous landlocked country on the list with a population of approximately 100 million people; followed by Uganda, with 40million; Afghanistan, with 33million; and Uzbekistan, with 32million inhabitants. There are bigger countries than Ethiopia on the list in terms of landmass, but with much smaller populations. 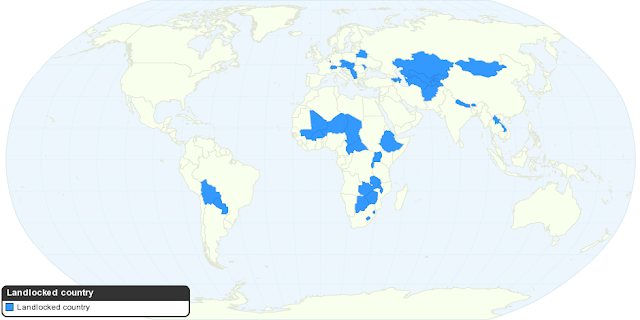 For instance, Kazakhstan, Mongolia, Chad, Niger, and Mali all have bigger land mass than Ethiopia. The combined population of all the LLDC’s is about 475,818,737 or roughly 6.9% of the world’s population (C. Dempsey). Paul Collier (2007) surmised “if you are coastal, you serve the world; if you are landlocked, you serve your neighbors.” So then, what happens to your economic performance if you are landlocked, your neighbors are poor, small, warring and unstable? Efforts to avoid being landlocked include acquiring land that stretches to the sea, and making arrangements on getting free transport of goods through neighboring countries. In all cases, however, losing access to the sea has enormous implications to a country, including, militarily, politically, and most importantly, with respect to trade and, hence, economic activity and performance. It was surprising, therefore, when former Prime Minister of Ethiopia, Meles Zenawi declared, that Ethiopia could do away with ports, and that the absence of ports would not and could not harm the economy as long as the country was able to garner income from the resources available to it. To accentuate his assertion, the former Prime Minister even gave Uganda as an example of a country that was landlocked but had performed well! His statement was surprising because history is replete with nations “large and small across the world who have striven to gain access to open waters, even at great expense in wealth, bloodshed and political capital”. Also surprising because it is generally agreed that, as a rule, being landlocked creates political and economic handicaps that access to the high seas avoids. So, was the former Prime Minister’s claims justified based on evidence available at the time and since? What detrimental repercussions did the policy have on the country’s external trade performance, if any; and was the policy in concert with the long-term interests of the Ethiopian state? Was the Statement Justified Based on Evidence? A quick survey of the available evidence from the economics literature provides a good basis for answering the question: was the statement justified based on evidence available at the time or since? Economists Friberg & Irwin (2009), did a study of landlocked countries for the period 1950-2000, and concluded that there is a ‘hold up” problem, meaning problems attributed to landlockedness which reduce trade by more than 50%; and that free trade agreements can’t overcome the hurdles posed by landlockedness as they have only a weak effect on trade. Arvis et al. (2007) conducted a study of logistics and cost associated with being landlocked, and its impact on supply chain reliability, and concluded that landlocked countries are affected by high cost of freight services and a high degree of unpredictability of transport systems. Mockellar et al. (2000) did a study of economic development problems of LLDC’s and concluded that the empirical evidence confirms these countries experience slower economic growth. Gallup et al. (1999), did a study of geography and economic development, and concluded that those regions located far from coasts and ocean-navigable rivers have to bear heavy transport costs of international trade. Furthermore, coastal countries have higher incomes than land-locked ones. Singh (2010), conducted a study of international trade and economic growth, and concluded that the contribution of international trade to growth depends on the volume of economic activity (i.e., it has to be large enough to make a difference). Rodrik et al. (2004), conducted a study of the role of institutions vis-à-vis geography, and concluded that the quality of the institutions of a country is most important and significant for its income level. Because institutional quality can be controlled, it has more roles to play in growth than does geography, or even trade, which cannot be controlled. In a study conducted by Collier & Gunning (1999), they concluded that Africa had grown slowly during the 1970s and 1990s, and that was largely due to policies, which reduced the region’s openness to foreign trade. Furthermore, poor delivery of public services was the main hurdle of economic growth in the region during the period. Frankel & Romer (1996), conducted a study of trade and growth, and concluded that the countries’ geographic characteristics have significant effect on their trade, and even more effects on income. All of these studies employed cross-section data, and used econometric techniques of varying degrees of sophistication. In yet a highly significant and recent work, R.C. Paudel (2013), conducted a sophisticated study of landlocked countries’ performance; and concluded that landlockedness remains to be a significant problem, and is a specific constraint to export performance and growth. At the same time, he also observed, that LLDC’s have opportunity to improve their export performance by: creating a more trade friendly environment through lowering of tariffs; reforming their exchange rates; and involving themselves in regional trade arrangements, among others. Paudel’s study further concluded that the market size of the neighbor has significant impact for a landlocked country, indicating that a one per cent increase in the market size of a neighbor of LLDC impacts its growth by an average of about one and half (1½%) percentage points. As a consequence, a landlocked country surrounded by large economies has a more advantageous environment for economic growth than those locked by poor countries. A sobering implication of the Paudel study includes the finding that governance quality has statistically significant and positive impact on economic growth in landlocked developing countries. It suggests that if the quality of governance improves by an index point, on average, the rate of economic growth increases by at least two and half (2½%) percentage points, holding all other variables constant. Ethiopian policy makers should head this observation, as the country was included in his study sample. In short, then, and consistent with previous studies, landlockedness hampers economic growth for LDC’s in general, and LLDC’s in particular. The magnitude is, of course, different for different countries, depending on the country. What we also know now is that there is evidence that a good governance system and policy initiative of trade reform can help reduce the negative impact of the constraint imposed by landlockedness. What we can say further is that, in all cases, however, these countries (LLDC’s) are still disadvantaged relative to countries with similar policies as openness is positively associated with growth. The moral of the story here is that trade related cost is more crucial to improving export performance in LLDC’s than just trade liberalization or reform. To be sure, there are benefits to trade liberalization, but when that is compared to other countries; the benefits are certainly lower. Was the Policy in Concert with the Long-term Interest of the Ethiopian State? Being landlocked remains a specific constraint for the export performance of Ethiopia. The fact that the country has attempted to gain access to Sudanese ports in the North; securing the continued use of the Djibouti port to the East; and now, negotiating the use of the port facilities at Berbera in Somaliland, is an indication of the stresses Ethiopia is experiencing notwithstanding Meles’ claim. There have also been attempts as well as future plans in the works to use the Mombasa port in Kenya to the South. That there are inconveniences, insecurities as well as delays experienced by business people within the country in terms of logistics and reliability is undeniable. Furthermore, it is generally assumed that 30 to 40% of the cost of goods in the heartland can be associated with transportation costs alone. The question, thus, remains: how much faster could the country have developed, holding all other variables constant, had it had its own outlet to the high seas? While it is generally acknowledged that Meles was at his best when warring with Ethiopians, taking on the one state adversary that landlocked his country was, in the writer’s opinion, against everything that defined him. It was against his worldview, against his ideology. Granted, that because distance-related trade costs restrict export performance more in land locked developing countries than in other developing countries, the decision to protect a nation’s interests is always a cost/benefit consideration over the long-term. As such, a leader willing to protect the long term interests of the nation would have been willing to sacrifice a great deal and inflict what ever cost it would have required to safeguard that interest. That it did not turn out that way cannot now be considered a “win-win” given the available evidence regarding this matter.